i use page protectors on all my self printed pages.. as long as they are marked "acid free" on the package you will be fine.. no worries. Is there a thread for this project and if so please tell me where it is? Acid-free page protectors are fine as long as you remember to keep your albums stored upright. I've run into albums where they obviously had stored the albums stacked and some of the stamp ink stuck and reacted to the "page protectors". You'll find out in 5 years if you stored them improperly. If you live in hotter climates, you would want to use archival page protectors and thumb through your album pages FREQUENTLY (that's a good thing, right?). No glare page protectors look great on finished pages. I don't have the patience for them because most of my pages are not "filled", and as a WW collector can't afford the expense and extra shelf/binder space needed to use them. But they do look nice! Just a heads up for those seeking to complete the album. There are a couple of stamp-issuing entities in the album for which there are NO cheap stamps. For example, all the New Britain stamps have a premium. I think there are maybe up to 10 stamps which catalog for ~$25 (I haven't checked the current catalog values). 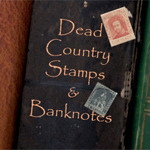 The average catalog value of stamps of New Britain is probably $100+ and there are quite a few 4-5 digit catalog values. They aren't that easy to find (not even the "low" catalog value stamps). So if you happen to see one for cheap, you should jump on the opportunity so you can complete your album. And if you already own one, congratulations! great point khj !!! some of those are going to take a lot of work to fill out..
i like the Album, and downloaded it and printed it too. i think i have a stamp for every country too. Which stamp would one place in a slot, if there was one, for Northern Ireland? Northern Ireland is part of the United Kingdom, and the UK is not mentioned, just GB, and NI is not part of GB... Wales, Scotland and England are not listed separately, but GB encompasses them. The issue is the "title" given... If it said United Kingdom, then that would be OK. The stamp I would stick in for NI would be the Giant's Causeway 2nd class stamp. FairyFoot is correct that the header should be United Kingdom. Unfortunately, stamp collectors are creatures of habit. GB is the traditional heading in the Scott catalog (and several other major non-US catalogs) as well, and that has stuck regardless of any geopolitical changes. Likewise, you will find almost all the major album manufacturers will lump them all under their Great Britain album section rather than their United Kingdom section. Hey, even Stanley Gibbons puts Northern Ireland in their Great Britain catalog. Not saying it's right, just saying that's how it is with catalog/album makers. There are other examples as well. You will also find this problem with dead countries. Compare between Scott, Stanley Gibbons, Michel... and you will find some stamp listings placed in different parts of each catalog. I like this alot, well laid out and interesting. I doubt anyone will ever complete as some countries will be near impossible to find outside of museums. Regarding the album, I do find a few errors, inconsistancies and omissions. Wonder if they are interested in correcting them? I couldn't find anyone to contact - does anyone know? Click on the link provided in kacyds OP. At the bottom of that webpage is a link to "forward email". I suggest using that. Be prepared for some counter-arguments, though. You know how philatelists can get when it comes to the nitty-gritty. I'm guessing some of the powers-that-be involved in project are probably not "push-overs". The obvious errors I'm sure they'll acknowledge. Depends on how far you intend to push "points of contention". Always brings out interesting discussions as long as they remain civil. On a side note, I've greatly enjoyed your website over the years -- it's been a fixture in my bookmarks for awhile. Well done and thanks! OK, Thanks for the complement and the warning. Page 95 and 96. Why doesn't Armenia and Azerbaijan include the "National Republic" of 1919-20 when Georgia does? They all joined up together to form the Transcaucasian Federative Republic before becoming part of the Soviet Union. And later all of them became independent again in 1991. They should all at least be consistent. The only reason I noticed these is that my winter project is to go through my Russian Area stamps, so I was looking at the album to see how it compared to my "dead" countries list. I am always looking for countries that I might have missed. I'm guessing they didn't "beta-test" the album, and that's why you're finding the obvious errors as well as seeing the album lay-out in landscape mode. Well, it is free... and we certainly appreciate the thought, money, and time they put into designing the album pages. Is anybody else noticing this kind of thing? Just wondering if everyone that started this album is still going at it. It's been almost 2 years since this topic was started. I'm still waiting and hoping to find some free pages that are not in landscape form. I like the idea of trying this collection, but the page layout has kept me from trying. We still have ours (i think).. I will have to look.. if not we may start this one up again its such a great way to teach littlemonkeybear about the world and with her being 10 now she will enjoy it more. This is really interesting, I was unaware of it's existence. I am going to give it a try, and I think my youngest daughter might like it. She has an interest in stamps, but has trouble knowing where to start. Ross and I have found away to print the album in portrait and allowing the whole page to be seen. Ive started the Album again in the thread of a stamp from every country. in the new format and in color to I will be editing the pages to to make sure all areas are added to each country, also fixing some errors on dates as well. Johnnyo.